Ashutosh Gowariker’s Lagaan is the most definitive Indian film that truly crossed over and appealed to people from all over the world. Moreover, that Lagaan is the first Hindi film I ever saw in a cinema hall, is what makes this film special for me. I saw Lagaan at least four times within one month of its release in a theatre called Suprageet in Salem. Today we celebrate the 10th anniversary of the release of Lagaan. And here I write or rather I should say re-re-write, again, on Lagaan background score, which is A.R.Rahman’s best yet. Lagaan is one of those films for which A.R.Rahman composed Ilaiyaraaja-level background score. In Lagaan, every known ingredient of a typical Indian masala film is in near perfect proportions. A.R.Rahman had to follow and use almost every single film scoring rule and technique for writing the background score of Lagaan. Every principal character gets a musical theme. Every dramatic moment gets an uplifting music score. Every song’s melody is used appropriately in the background score throughout the film. Every musical theme that is not based on any of the song’s melody is deliberately tuned catchy, so that it could get a life even out of the film. There are big bangs and grand orchestral outbursts. There are moments with measured silence amidst ample music. Every tear-jerking moment is filled with an instrumental soliloquy. Every instrument in the score is carefully chosen, and every piece is carefully orchestrated to convincingly transport us, a century back in time. The beauty of Lagaan’s background score lies in the way all of these techniques come up in the right proportion, in the right context, in the right moments of the film. Distinct musical themes are written for principal characters in a film. They add a sense of uniqueness to each of the characters, and help the audience understand the characters quickly. The theme could be inspired by any aspect of a character; it could be their mannerism, body language or attitude, relationship with other principal characters or their prevalent mood and emotions. The main theme of the characters plays when they first appear on the screen or when a trait of theirs, which is critical for the drama, is established for the first time in the film. It recurs whenever the focus is shifted to that particular character, or whenever the characters establish that unique trait of theirs, based on which the theme music is written. In a film like Lagaan, which has a running time of more than 200 minutes, a film maker cannot waste screen time in elaborately establishing the nature of every single character of the vast and varied ensemble. Within the given screen space and time, Ashutosh seemed to have done his best and delegated the rest to Rahman. Rahman’s character themes are crucial in this film, helping the audience to understand the uniqueness of every single character that the film maker wants to highlight. Rahman has written distinct musical themes for Bhuvan (Aamir Khan), Gauri (Gracy Singh), and Bhuvan’s mother (Suhasini Mulay), Captain Russell (Paul Blackthorne), Elizabeth (Rachel Shelley), Laakha (Yashpal Sharma), Guran (Rajesh Vivek), Goli (Daya Shankar Pandey), Bagha (Amin Hajee), Tippu (Amin Gazi), Ishwar Kaka (Shri Vallabh Vyas) and Yardley (Chris England). Conventionally, in an Indian film, a hero’s or main protagonist’s theme appears when the character’s face is first shown or when their characteristics are first revealed in the film, giving a cue for the fans to stand and cheer up for their hero, when they watch the film in cinema halls. Lagaan is not a regular Indian masala film to have a grand hero introduction scene, in which a hero could appear onscreen with the backing of blowing trumpets, and throttling orchestra. There is no any specific musical theme for Bhuvan in Lagaan, though there is a music piece that recurs in scenes that establish his courage. This piece is not exclusively used for Bhuvan, but still, it could be termed as one of Bhuvan's theme. When we see Bhuvan for the first time on screen, he is in the forest, aiming to hit a deer with a stone in his hand, and we are not quite sure about his nature yet. Later, when we come to know that he was trying to distract the deer from getting hunted by Captain Russell, we realize his true colour. The brassy orchestral piece with pounding drums, pumping up the energy in the action, as Bhuvan runs alongside the deer, works on two levels, one, as a grand establishment of Bhuvan’s courage and his empathetic nature and the other as the racy and rushing incidental action music. The same brass piece plays when Bhuvan comes forward to pick the ball and picks it despite an English man warning them not to touch the ball. It perfectly fits for Bhuvan’s dare and the subsequent tension in the scene. The notable variation in music in this scene is the elimination of the pounding drums, which makes the music sound in sync with the tempo of this scene. The music piece is again used, much later in one of the most crucial moments of the film, for a totally different purpose. It is when Bhura (Raghuvir Yadav) gets himself out to save Bhuvan. With heavy bangs of Piano chords perfectly echoing Bhura’s confusion, the music keeps up the overall shock factor and tension throughout the scene. Captain Russell’s theme speaks of his arrogance. Bass strings playing discrete phrases of eerie melody and the sound of wind Chimes speak of menace and arrogance of Captain Russell. The sound of Wind chimes is an intriguing choice here. Wind chimes produce music, when a relatively harsh wind or an object forcefully disturbs the peacefully hanging metal tubes that are arranged in a defined pattern. Captain Russell’s arrogance being the harsh wind here disturbs the peace of villagers leading to all the noise, music, chaos and drama. Captain Russell’s theme first appears when Russell points the gun at Bhuvan, threatening to kill him for distracting the deer that he was trying to hunt. It is also used in some of the most crucial moments of the film - when Captain Russell asks a vegetarian - Raja Puran Singh (Kulbhushan Kharbanda), to eat meat and when Captain Russell tells villagers that it is possible to cancel the tax on one condition. These are moments, when the arrogance of Captain Russell is at its peak, and the decisions that he takes out of arrogance in these scenes are critical for all the subsequent action and drama. In Captain Russell’s theme, there is also a subdued wily melody that plays on a wind instrument, which initially sounds to imply teary eyed Bhuvan’s remorse for hunted deer. This subtle windy melody recurs when Captain Russell meets Bhuvan again in the cricket field and says "Jungle mein thum hi the naa" (Are you the one who was there in the jungle the other day? ), to our realization that it is a theme to establish the gradually growing friction between Bhuvan and Captain Russell. Bringing that melody again in this scene aurally reminds us the negative vibes and friction that had already developed between Bhuvan and Captain Russell in the earlier scene. In a series of events, while the film establishes its principal characters, their characteristics and the nature of relationships they share with each other, through the visuals, so does the musical score. The composer not just gives a theme to each one’s characteristics but also introduces a theme to the vibes in their relationship - in this case it is the gradually growing animosity between Bhuvan and Captain Russell, which is pivotal for the drama that is going to unfold. This way of linking scenes and emotions of two different scenes through music cues indicates that there was a genuine thought process behind writing the score of every single scene of the film. Gauri’s theme is for her jealousy towards Bhuvan and Elizabeth’s growing friendship. Gauri’s character turns jealous only after Elizabeth comes into Bhuvan’s life, so it would not be appropriate to use Gauri’s jealousy theme in her introduction scene itself. However, it might not have sounded odd, because a part of Gauri’s jealousy theme fits for the beauty of Elizabeth. It plays for Goli's expression, who gets awed by Elizabeth as we see him in that round trolley shot of him looking stunned with his mouth open. The use of Gauri’s Jealousy theme for Elizabeth’s beauty is justified in a way, as it is the Elizabeth’s beauty that makes Gauri insecure and jealous. In Gauri’s introduction scene, the Camera slowly moves from focusing on Gauri’s palm to upwards. While the visuals reveal her cute face, Rahman starts the music precisely from the moment we see Gauri’s palms and hear her voice. Rahman treads a conventional path, with earthy flute and serene Santoor playing vibrant melodies and folksy Dholaks beating rhythms to match with the inherent innocence and pleasing nature of the character. In Gauri’s jealousy theme, however, the doubtful melody on flute, multilayered sounds and subdued percussions precisely underline the turbulence in Gauri’s mind. Gauri's Jealousy theme plays in all the scenes, where the focus is on Gauri’s furrowed eyebrows as she watches Bhuvan and Elizabeth talk cordially with each other. Jealousy is an evil but Rahman differentiates the jealousy of Gauri from that of Laakha in the score. Though Gauri is jealous, there is a fun element in it for the audience, but the same cannot be said about the jealousy of Laakha. While Rahman uses a flute for both, he brings in the difference by pitching the Laakha’s theme much lower than that of Gauri’s. Laakha’s theme is a short menacing melody played in the lower registers of a flute. The windy sound, with which the melody is deliberately played, brings with it an evil aura. It suits the jealousy, cunningness and evil intentions of Laakha. Laakha’s theme plays in the first scene in which he appears, wasting no time in hinting at his nature. The flute piece recurs whenever Laakha plays against his own team in the final match, secretly supporting the opponents in order to quench his thirst for vengeance on Bhuvan. It is surprising how the same melody conveys a totally different emotion of the same character, when shifted from lower registers of a flute to higher registers of a violin. When Laakha finally confesses and tells Bhuvan why he is playing against his own team in the match, the violin version of the theme played in a much lesser tempo is used. We tend to sympathize with him when this melody on violin instantly turns the dark shades of Laakha to grey. We are almost moved to tears when the violin version of the theme makes one final appearance for Laakha, who gets miserably hit out by Yardley’s tricky, wild and wily spell. Yardley’s theme is for his bowling style. It is his fiery bowling style that brings in some sober moments for the Champaner team. His theme is single gong of a church bell resonating with a tone of menace. Whenever he aims for hitting the batsman’s head with his ball, Yardley’s action is captured on screen like a visual motif – camera lingers on, as he exchanges the ball between his two hands and it slowly moves up to reveal teeth-clenching fury in his face. Whenever this visual motif appears before the delivery of a ball, we are sure that the batsman is in danger. Rahman’s gonging bell motif fuels our fear further. Goli’s theme is for his unique bowling style. Goli rotates his hand many times before releasing the ball. This action confuses the batsmen who face his delivery. The batsman becomes unsure of when to time his hit. The theme for this action is a rhythm on a percussion that sounds like that of an earthy south Indian percussion instrument called ‘Udukkai’, with an additional layer of hits on a triangle, looping around. This rhythm plays in Goli's introduction scene, in which we see Goli rotating his hand many times before throwing stones at Bhura’s Chickens. The film maker cleverly convinces the audience by pre-introducing Goli’s technique thereby making his bowling action in the match natural and convincing. Rahman gives a nod to the film maker by using a common theme to link Goli’s bowling style and his stone throwing technique, and as a bonus, the rhythm naturally enhances the comic flavour in the scenes where batsmen look bewildered by the unpredictability in Goli’s spell. Rahman makes a percussion instrument - Dhol, to play a character in the film score. Dhol beat is the voice of the mute percussionist Bagha. He always expresses his emotions by playing rhythms on Dhol. Bagha’s introduction scene starts with an energetic Dhol rhythm, which he plays to call all the villagers and make them witness the rain clouds finally coming over to their village. The same rhythm is exactly used when he finally gets his catch right in the match (after missing many critical catches) implying how inseparable Bagha’s emotions and Dhol rhythms are. Like how, each language has a definite word to convey something, Rahman gives definite rhythm patterns for each of Bagha’s emotions. He links Bagha’s excitement in seeing the rain clouds and his excitement in catching the ball with the same rhythm pattern. Rahman, who uses a Shehnai or violin or Saarangi for sober moments of Champaner, shrewdly uses raw Dhol beats with deafening silence in between each stroke, to imply Bagha’s disappointment, when Bagha, the batsman gets out in no time. Guran’s theme is for his funny beggar-saint looks and his unique body language. The theme music is multilayered with varied percussions playing rhythms that match with Guran’s walking and bowling style. There is also a layer with Ektara plucking its strings in sync with the beat for Guran’s saint-like looks. Guran’s theme first joins him, when he picks the ball, walks up to Bhuvan, and tells him that he is with him. The theme comes back to him again in the final match when Guran starts to bowl, plays smart and picks a wicket. A rhythm on Kanjira plays out in a slower tempo creating a mild anticipation when Guran bowls his first ball. We take Guran seriously when the tempo of Kanjira rhythm slightly increases in the second delivery. Guran theme finally starts to play when he fiercely walks forward, fully confident of throwing the batsman out with this delivery. It continues to play for the euphoria he whips up by winning a wicket in the third delivery. The same rhythm of Guran recurs when he comes to bat, but interestingly Rahman turns silent after that. With all that odd posturing of his, in front of the wicket and aggressive batting, Rahman is too aware that Guran’s innings is not going to continue for long. There is nothing dramatic that happens in this episode and so no music. A classic western melody, oozing with romance is Elizabeth’s love theme. Throughout the film, this theme never jumps on to any Indian instrument and is always elaborated differently with symphonic western orchestration. The Elizabeth’s love theme comes from the melody of the English part "My heart it speaks" of Oh re chori song. Elizabeth’s introduction scene does not have this theme; instead, Rahman uses the flute piece from the title score. Elizabeth’s introduction scene comes right after the tense moments between Russell and Bhuvan in the deer-hunting episode in the forest. The grim feel in the previous scene is suddenly relieved when we hear a pleasant western flute playing a mellifluous melody. The melody instantly communicates the charm, dignity and tenderness of the character in focus. It would be totally wrong to use the main love theme here, because Elizabeth is yet to meet Bhuvan. Elizabeth’s love theme first appears as an Oboe solo when Elizabeth, impressed by the courage of Bhuvan, passionately fixates her eyes on him and asks what his name is. With Elizabeth’s eyes fixed firmly on Bhuvan and with Rahman’s romantic melody filling the communication gap - if any that could arise, we realize what Elizabeth begins to feel for Bhuvan. The theme that just appeared on a solo instrument gets a heavy orchestral backing, when Elizabeth secretly comes out of the cantonment. She does so to meet the villagers and help them in learning cricket, against the will of her brother Captain Russell. In this version, an Oboe takes over the theme with the strings section rushing through and pizzicato plucking under, for Elizabeth’s curiosity. For the visuals showing Elizabeth running out, it may sound odd to have the love theme, but it is fully justified as we know that she is going not only to help the villagers but also for her love towards Bhuvan. We get to know the reason behind her urgency at the end of this episode, when she proposes her love to Bhuvan. The mellowed strings section plays a deeply emotional melody in this love-proposal scene. The strings here bring out a state of desperation, longing, pain, suffocation, and earnest love. The emotion peaks and chokes with an aching solo Cello piece, when she is fighting a battle within herself before saying ‘I Love you’ to Bhuvan, who does not understand English. The whole strings section piece from this scene plays again, in the climax, when Elizabeth bids farewell to all villagers. The difference in this music, when it is used in the climax is that there is an additional Indian flute piece layered over, which plays out precisely when Elizabeth hugs Bhuvan’s mother. It is Rahman’s musical way of saying ‘Here she is, an English lady returning to her homeland with an Indian in her heart and as an Indian at heart’. Ishwar Kaka is known as a doctor and Gauri’s father for the most part of the film. There are no scenes focusing on Ishwar Kaka until he comes to bat in the final match. Finally, here comes his theme. It is a string of Tanpura straining and droning for the strained and exhausted Ishwar Kaka, whose stamina and energy seem to be fading after each run. The little boy Tipu, the runner of the injured batsman Ismail (Raj Zutshi) gets a musical theme for energy and enthusiasm he shows when he gets an opportunity to contribute on the cricket field. In Tipu’s theme, the flute piece that traverses notes in a hyper speed perfectly fits for the speed with which Tipu crosses the grease to fetch more runs for his team. After Tipu comes in, overall momentum of the game increases. Bhuvan and Ismail are scoring runs nonstop. The pounding percussion rhythms and riffing guitar in the cue capture this sudden acceleration of momentum in the game and it adds to the euphoria in the high-scoring moments of Champaner team. The momentum picks up further with Rahman shifting to the folk rhythm of ‘Mitwa’ song that has a maddening increase in tempo on every next cycle of the beat. The camera slowly shifts its focus onto Tipu, who is running between the wickets. Russell (off-screen) and we, the audience, realize the mistake that Tipu has been making for a while and when the tempo of the rhythm is about to reach its peak, the music stops suddenly, along with the puzzled Tipu, who stops after running out of the grease. When Tipu begins to run and moves out of the grease-line even before the delivery of the ball, the bowler hits the stumps. This scene is one small sample of how powerful an impact a precise shift in the score can bring in a scene. The impact, the surprise, and the shock we get and the suddenness of it all in this scene is unthinkable without Rahman’s technique of accelerating the percussion rhythm to extreme tempo and applying a sudden brake at the peak. For the scenes in which the spot light is on Deva Singh Sodhi (Pradeep Rawat) – a Punjabi and the only experienced Cricket player in Champaner team, Rahman adds a quintessential Punjabi flavour in the score. In Deva's introductory scene, we get to listen to the strings from the title score, but with Rahman plucking a Tumbi string, the music gets a typical Punjabi flavour, and it marks the entry of a Punjabi character. The Bhangra music plays for the euphoria and the joy of Champaner team when Deva gets the last wicket. Rahman could have easily used the same ‘Mitwa’ rhythm here which he used for other wickets, but it is Deva (a Punjabi) who is getting the wicket, and it has to be Bhangra. In Tipu’s theme, there is a brief pizzicato phrase. We can hear it in the beginning of the piece, as it plays when Ram Singh announces that Tipu will be the runner for Ismail. The sound of this pizzicato phrase aptly fits for an unexpected twist in the tale. The same pizzicato piece plays in another unexpected event that turns out to be the game changer. It is when Bhuvan realizes that Kachra, whose spin was not working in the beginning of the game, can deliver the ball with that magical spin now. Now that, the ball has become older, Kachra’s spin begins to work, which leads to the exhilarating Kachra’s hat trick episode. When Kachra gets his first wicket, we just get to hear a happy rhythm, but nothing substantial happens in the score, and in the second wicket, the same rhythm repeats. Only when Kachra gets his third wicket in a row, the uplifting interlude music of the ‘Mitwa’ song plays in its entirety moistening everyone’s eyes. The same piece of music was used when Bhuvan tells the villagers that it is this crippled Kachra, who is going to win the game for them. Bhuvan’s prediction has come true and Rahman acknowledges it by repeating the musical motif. This interlude of the ‘Mitwa’ song plays in many moments throughout the film. It links all the scenes in which the villagers, one after the other come and join the team and boost up Bhuvan’s courage and confidence in winning the bet. It is first used when Gauri comes to meet Bhuvan at midnight to tell Bhuvan that she is with him. The song itself plays in its entirety when Goli and Ishwar Kaka join the team. It reprises again when Ismail and Arjun join the team and finally when villagers, who were initially against having a person from lower caste in the team, agree to include Kachra in the team. These happy moments would not have suffered much without this piece, and some random, euphoric plucking of Sitar would have worked, but still Rahman chose to link these moments of similar emotion with a common musical theme. It is choices like these that transform a film score from being just right to indispensable. Rahman uses the melody of the songs in the right amount and at right places in the film. The rousing Chale Chalo melody plays in the scene where Bhuvan demonstrates the game of Cricket to the villagers. The melody is not used as it is; Rahman orchestrates the melody according to the actions in the scene. The melody first appears on a lighter note in Guitar, and then gets little more serious and curious on a flute, aping the anxiety of the villagers, who are waiting to see Bhuvan hitting the ball. The melody then moves down to lower registers of strings aping the nervousness of Bhuvan, who is well aware that people are watching him in anticipation. Finally, it moves away from the song’s melody to a pleasant flute and sitar flourish to sound the excitement of villagers on seeing Bhuvan hitting the ball and the ball in turn hitting temple bell, which to the villagers sound like a go-ahead green signal from the God. Just like how ‘My heart it Speaks’ melody turns into Elizabeth’s theme, the instrumental version of ‘Oh re chori’ becomes the love theme of Bhuvan and Gauri. The love theme plays right from the first scene in which we see Bhuvan and Gauri together having their conversation at leisure, and it instantly hints at the romance between the two, which had ripened much before Ashutosh Gowariker decided to tell their story. The real genius of Rahman is in the way he brings all these melodies from the songs together to underscore the multilayered happenings in the climax, when finally Champaner wins the challenge. It starts with soul stirring strings playing the rousing melody from the interlude of ‘Mitwa’ song that perfectly matches with the emotional outburst of us - the audience and the villagers in that precise winning moment, and it then continues with rhythm from the Mitwa song for the joyful dancing of villagers in the moment of victory. Soon a small phrase of signature melody from ‘Oh re chori’ plays on Indian flute for the shot of Bhuvan and Gauri hugging each other. Immediately another sober western flute piece emerges for Elizabeth’s disappointment on seeing Gauri and Bhuvan together. All these pieces play in multiple layers, over the ‘Mitwa’ rhythm that continues to dance in the background. Just because, the focus now is on Bhuvan-Gauri-Elizabeth love triangle Rahman does not cut off the rhythm to which the villagers are dancing in the background. Rahman just overlays the love themes over the rhythm, just like how the visuals overlap all of these different emotions of characters as one single event. Suddenly, music and dance stops. The score begins to sing Ghanan Ghanan melody when rain clouds approach. When finally rain god blesses the villagers with its shower, the chorus bursts into singing Ghanan melody, creating an eternal gooseflesh moment in cinema that would stay in our mind decades after watching the film. The chorus does not sing the lines, or subvert the melody with a hum; they sing the melody with open-mouthed ‘Aahs!’ because it was precisely a moment of euphoria for them and us. The melody of a Rahman’s song never matched a situation in a film as much as Ghanan melody matched in that precise moment in Lagaan. There are many other scenes in Lagaan where the score precisely follows the trajectory of emotions and moods in the scene. There is music throughout the scene in which Bhuvan contemplates about and subsequently accepts Captain Russell’s challenge. Background score for this scene is another example of how a score’s precision to the changing emotions and moods of the scenes is so crucial to create the right impact. The score starts with Russell’s theme, indicating that Russell’s arrogance has come to the fore once again and that it is going to create a serious twist in the story. When Russell and Bhuvan talk about cricket match, subtle, deep drum beats from behind prepares and hints at us about something crucial that is going to happen. When finally Russell starts to explain his challenge, a trumpet slowly rises from behind, and as he further enhances the bet, massive strings section kick starts a turbulence which Russell’s words have started creating in Bhuvan’s mind. The thumping beats with running strings in the background precisely cursors that a lot is running in Bhuvan’s mind at this moment, as he looks shocked, confused and surprised all at once. There is a constant bass in the background that keeps the tension intact. The bangs for all the shocks and surprises – the prominent one being for Bhuvan’s acceptance of the challenge are placed aptly. The whirlwind of strings in the end of the episode add to the chaos unleashed after Bhuvan accepts the challenge, while the helpless villagers run behind their King Raaja Puran Singh, who leaves the place without saying a word. The thumping beats and running strings we heard for Bhuvan’s turbulence in this betting scene play to a greater effect in another crucial moment when Laakha is shown flying in the air, in a slow-motion shot, to catch the ball. Change in Laakha's character is a radical twist in the drama, without which Champaner would have never won the match. There is no layer of strings this time. The thumping beats play to create the effect and a sitar joins later to emphasize the ecstasy of Champaner team, when Laakha begins to play for Champaner and gives it all for winning the game. The thumping beats and running strings play again in the climax, when Bhuvan gets his last chance to win, in the last ball of the match. Suddenly, the energy comes rushing. There is a sign of hope. We as an audience, who were already sitting at the edge of the seat, adjust ourselves to sit comfortably and confidently again. There is a sense of relief when we come to know that we have one more ball. That, Bhuvan’s regain of energy, and that which made us, sit comfortably again is not just the twist in the story and its visual staging, but also the energy that every beat Rahman pumped along with it. For Champaner team’s struggling times in the cricket field, Rahman uses a short aching violin piece. It plays in the scenes in which British team continuously hits boundaries and sixers. At the end of day’s play, with 99 runs for 4 wickets, heads look down, eyes are filled with despair, and Rahman pours in the helplessness and the sense of loss with a deep Bansuri piece and a yearning female alaap. Majestic brass themes for Russell’s horse riding scenes add to the authenticity of the period that the film wants to recreate. The Title music that starts off with a beautiful flute piece acts as a primer for the audience to comfortably enter into the British era in which the film is set in. Ashutosh Gowariker’s intention in showing us the properties from those periods along with credits are clearly to prime the audience and take them back in time, to an era in which this story happens. When Indian elements are on focus, Rahman uses Indian sounds and instruments. When British properties and Victoria’s paintings come under spotlight, the music enters a dark orchestral zone with turbulent rhythms, symphonic strings and wily flutes. In a film stuffed dense with many layers, a composer cannot use a single theme for the film as a whole. In Lagaan too, there is no single music theme that represents the whole film. However, there is one music theme, which was included as a track titled as ‘Lagaan – Once Upon a time in India’ in the film’s song album. This piece of music gets repeated throughout the film without referring to any single character. This theme has two distinct parts, one - a soft, melodic humming sung by Anuradha Sriram, which plays for all scenes focusing on Bhuvan’s mother, and the second part is Hey bhaiyya choote Lagaan - a spirited anthem of the villagers that plays for all dramatic, uplifting moments. Hey bhaiyya choote Lagaan part of the theme plays in a subdued form when Amitabh Bachchan’s voiceover explains about the functioning of the government and Lagaan in that era. It is loudly used in its entirety in the scene where each member of the Champaner team walks forward and stands with ample confidence in their eyes, in front of Captain Russell. It plays when Bhuvan and Deva enter the field as opening batsmen. When Raam Singh announces that we have 20 Overs left for the day, the main theme of Lagaan starts playing in its entirety again, increasing the already raising momentum in the game to new heights. Finally, there is this enthralling, nail biting last over of the match, where Rahman’s score is perfect, bang on, hitting right notes at right spots. Rahman puts us right in the middle of the cricket field in Champaner, by bowing the bass registers of Cello and hitting high octaves of Piano to tickle to the restlessness that prevails for each ball that is being bowled to the crippled batsman Kachra. When the whole village cries out for Kachra to hit the last ball, the strings slowly gather to a crescendo. It then comes to a deafening halt when Kachra’s hit does not yield the necessary run. When luck favours them with another ball, everyone is relieved. The momentum builds up again with Rahman shrewdly bringing up the same whirling strings and thumping rhythms that he already used for Bhuvan’s contemplation in accepting Russell’s challenge. We sit back firmly in our seats. Various thoughts pile up one after the other in Bhuvan’s mind, when he is preparing to hit the ball. Yardley comes running to bowl. There is a deafening silence except the sound of an accelerated wind throttling through a nozzle. Bhuvan hits the ball hard with all the energy that is left in his body. We hear the sound the ball makes as it touches the bat. It is the hardest Bhuvan ever hit the ball in this match. Ball goes flying in the air in slow motion. A powerful brass section intermittently pumps up tension, as we see the ball flying to fall directly in the hands of Russell. Rahman hits two banging strokes of shock when Russell catches the ball. Umpire looks at Russell’s legs and the boundary line, and then raises his hands to the sky. The rest is history. A fantastic post that details the complete score. It is indeed his best ever score and I dont know if he will be able to score anything like that again. It depends on the director, script and also the drive to not compromise I think. Lagaan is an exception where everything fell in place, in right proportions. Amazing write-up man! Literally brought back the scenes to my mind and the nuances of the music behind it! Excellent write up Suresh. Listened to all the themes again. I noticed that the 'subtle windy melody' is the same tune as the one that is played on strings in the 'lagaan - once upon a time' track. @suresh kumar: I am still awaiting your piece on Swades's background music which I rate above lagaan. Senthil Kumar - Thank you. Aakarsh - Thank you. A movie like Lagaan happens only once in a lifetime. Iruvar score too is very close contender for "all-time best ARR score" title. Tipu - Thank you. Glad to know it did. That was the intention. Ramesh - Yes. It is. A new find again. Ignoramus scribbler - I will write one on Swades score for and you are definitely going to read it. Interestingly I rated Lagaan and Iruvar as top of the Rahman's BGMs. shocking sounds hear and there. ah! crap. It should've been programme music not programmable music. Excellent one Suresh. 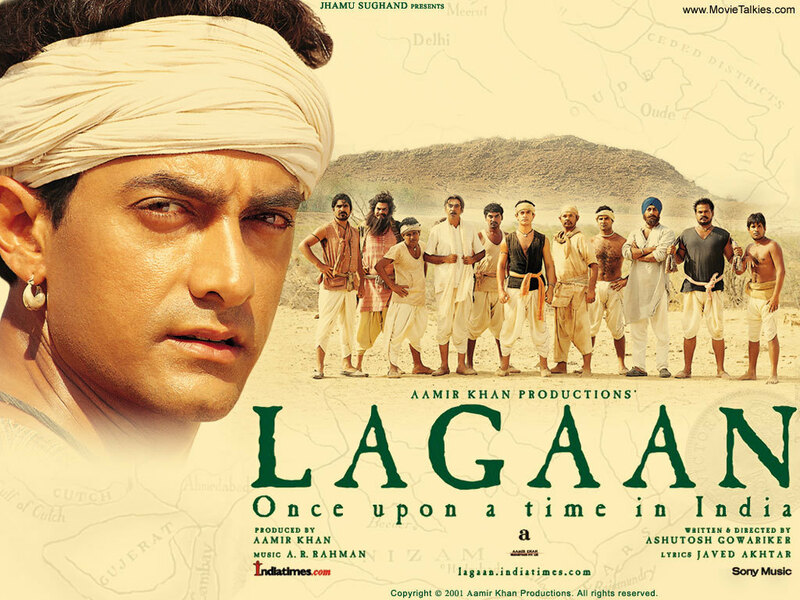 Lagaan is one of my favorite bgms by ARR. You, sir, are the man. Brilliant writing yet again :) Would be really grateful if you do The Legend of Bhagat Singh, Dil Se and Swades too.. cheers! I'm not dramatizing it but what you are doing with this website is a sort of public service, both to the lay audience, like myself, and the composers who do a truly thankless job. You're analysis is astounding, and it not only enlightens novice film buffs like me, but also makes us understand all that is packed beneath the layers by making us re-view the films. And it is thanks to you, as much as to Raja Sir and Rajni-Mammooty, that I love Dalapathi so much. Thank you so much, Suresh. Can you please post the mp3 for Re bhaiyya Chhoote Lagaan?